Life on the island doesn’t get much better than it is in North Saanich. Just minutes from the lively activity of Victoria to the south, the predominately rural lifestyle at the top end of this peninsula are a slower-paced, comfortable alternative to city culture, yet with all its advantages. Surrounded on three sides by water, North Saanich is home not only to Victoria International Airport, but also is the site of Swartz Bay ferry terminal which whisks passengers to Vancouver on the mainland. Living here is defined by a different aesthetic, however. Residents feel their connection to the earth, the pull of the water and the serenity of the blue-sky canopy above. Sailors find peace here, and the region’s agricultural past is an honored and well-preserved tradition. There is abundant room to catch the wind in the sails on a weekend, and there is time and space to cultivate a garden, plant a tree, and harvest vegetables. Modern marinas offer moorage and repair services for boaters; and the masts sway gently in the harbor. An active yachting program is teaching a whole new generation of youngsters to love and respect the sea. Residents of North Saanich come home to relax and, although there is a sense of modernity, it is still subdued and quiet. Does it sound idyllic? 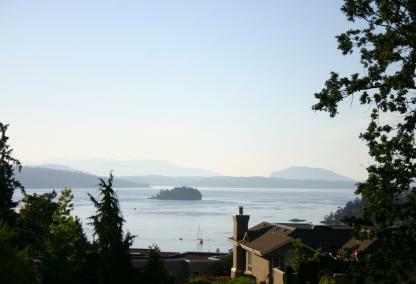 Many think so, and residential options in North Saanich tend to be more limited than in other areas. The focus is on maintaining the character of the land, with larger lots common and restricted development more the norm here.